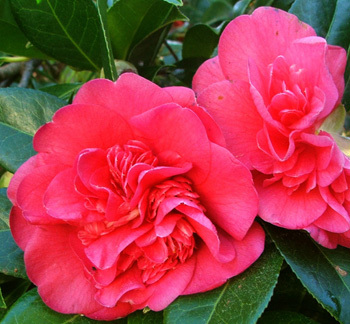 Most years I nod and smile at the Camellias in flower, then wander off with hardly a backward glance. They are cheery spring shrubs, but I don't linger. I'm too preoccupied peering down at my dazzling daffodils, or gazing into the borders anticipating the blooming of the rhododendrons. The spring season is uneven in tempo, and can suddenly lurch into fast-forward. It's easy to miss things. But not this year. This year is different, and I'm completely captivated. My Camellias are amazingly beautiful this year - I think it's the sunshine. Spring shrubs, like people, bloom better with lots of gentle sun on their faces. There's also a completely mundane reason for my newfound Camellia-awareness. I've been out and about trimming and thinning in the borders. So shrubs which used to be covered up by neighbours are suddenly delightfully out in the open. And, not only are my Camellias thus more visible, but also they are one year older, during which time I've sporadically fed them compost and manure. The more recently planted shrubs are definitely bigger and 'buddier'. Blame the weather? Why not! An early spring snow dump must have tickled their root systems, just when deep watering was needed. Shrubs which had already started blooming then went on hold for a couple of weeks. None of the buds were water-damaged, and so now I seem to have a second flush of flowers, and a succession of crisp but frost-free mornings on which to enjoy them. 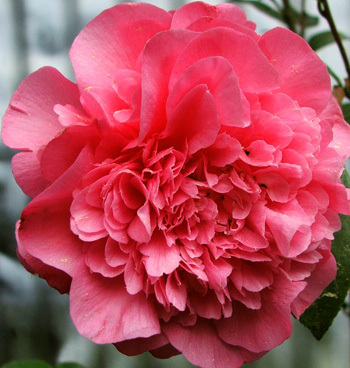 I love you all-inclusively, you lovely Camellias! I love the no-name shrubs, the sprawly shrubs, the fat, well-grounded shrubs - I even love the baby pink by the house, whose branches bend alarmingly under the weight of all its flowers. Praise, grateful praise for all of you, and good work for not succumbing to the snow and breaking too many branches, passing away through neglect, or displaying any ghastly disease or deficiency. Older, browning Camellia blooms are very off-putting for some folk. A friend suggests that the colour catastrophe is only really noticeable with white and cream flowers, and that all the reds and pinks get away with it. So if you're one of the offended, ditch the whites and creams! And when a label claims the flowers fall before they get browned-off - well, do you really believe it? Yes, no, maybe... Personally I accept the brown petals as part of the circle of life. I clean them off shrubs that aren't too tall - they make brilliant mulch. I grow quite an assortment of Camellias. The gentle arc of red and pink shrubs (all rescued, unwanted, from friends' gardens) in the Wattle Woods are some of the first to flower in my garden, along with the baby pink at the side of the house. None of the names are known to me. The removal of an overgrown conifer now allows another original shrub to show off its deep pink flowers. 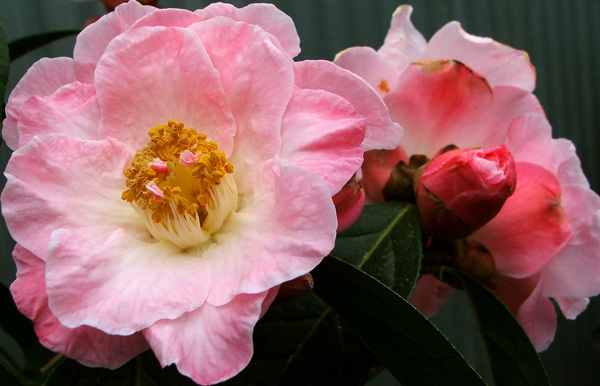 Behind the garage is 'The Most beautiful Camellia in the World' - AKA the larger single Pink Plantation. Neighbouring shrubs in here have smaller red flowers, and they've been rescued from the sale table, without labels. 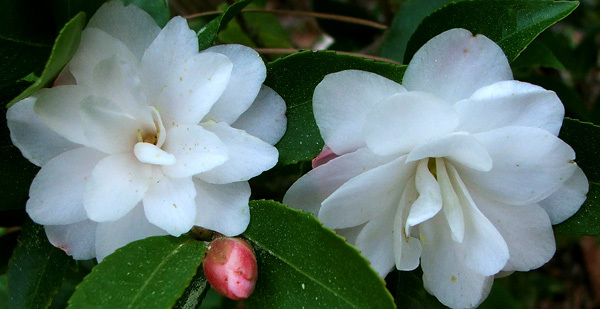 I also grow Camellia shrubs with tiny flowers, like the cute white Cinnamon Cindy and the large pink Gay Baby - these two flower discretely in mid-spring. By accident rather than by design there's a long flowering season in my garden, with the gorgeous fluffy pink Nonie Haydon being the very last. Most of my Camellias have either been rescued from the bargain bin at the nursery, or dug out of friends' gardens and relocated here. So I've really taken what I've been given, without the element of choice. It might well be time to check out an online nursery or two.